Seagate is fortunate to be located in San Diego with its farm in northern Baja California because this provides us with a year-round growing season. At least that is the theory. The summers are hot and dry with lots of sunshine. The winters are relatively mild. However, we have found that certain crops do better, growing faster and being ready to harvest sooner, when we do our planting during the summer. Tomatoes are one of those crops. The added heat (100-110F daytime temps) where we grow the tomatoes during the summer can cut the time required in half to less than 2 months, saving us labor (manual weed control) and water. 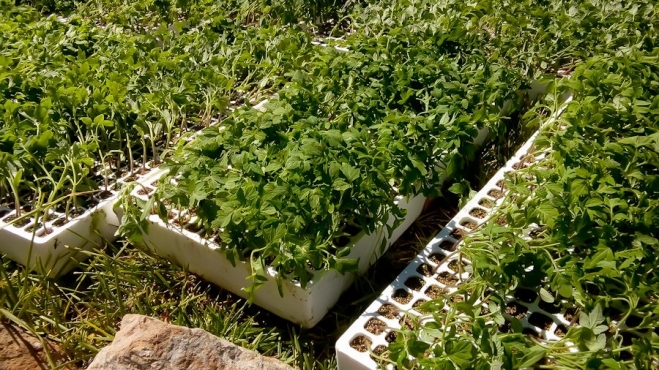 The first step is planting tomatoes, one seed per compartment in trays. We have much better results allowing the plants to initially develop in a protected area away from the field. Normally we plant between 40,000 to 80,000 seeds, each in their own slot. With luck, perhaps 75% will germinate. Of those, perhaps half will survive and produce. 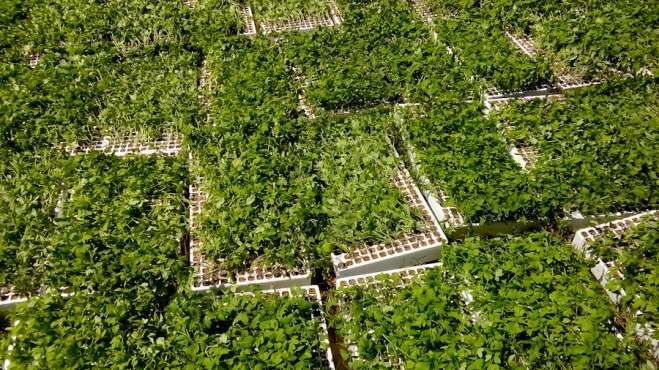 We allow these little plants to grow in the trays until they are 4 to 6 inches tall. This gives them a better chance for survival before we transplant them to the actual farm land. Usually this requires only ~2 weeks to reach this stage of growth. Then the tomato trays are transported by pick-up truck to the area of the farm designated for this crop. This is very hard work. 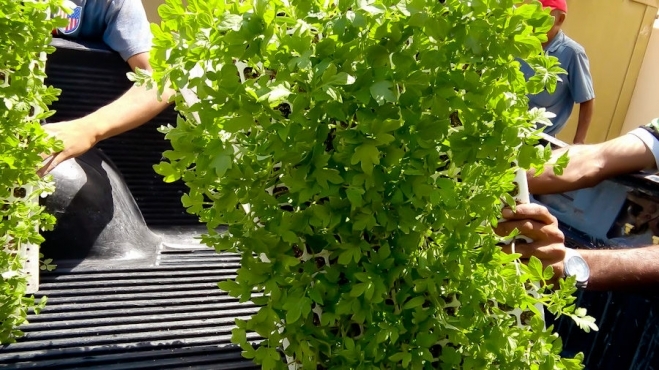 Each plant must be individually hand-planted while the summer temperatures are soaring. We use a variety of organic Roma tomato seeds that we have found to do very well in this climate. Hopefully within 4 to 6 weeks, the Roma tomatoes will look like this picture below, taken from a previous year. Notice the drip irrigation line running in the dirt in the bottom left corner of the picture. The field of ripening tomatoes should look like this by mid August. The green tomatoes will be allowed a little more time to ripen on the vine, turning bright red which will give us a peak level of lycopene. Eventually these tomatoes will be harvested (by hand) and returned to our Ensenada factory for chemical-free processing into our Lycopene-15 named for the 15 mg of lycopene per capsule. The freeze-drying process results in a yield of approximately 1 tomato per capsule since tomatoes have a very high level of water. When you shop in your local health food store, try to support the companies that operate their own farms and process their own products in their own plant. The rest are really just distributors with their own trademark. For relaxation, when not growing things like tomatoes in the heat, I enjoy an occasional dive trip looking for friendly creatures inhabiting the reefs. This fellow below is a juvenile barracuda shot (with a camera not a speargun, thank you very much) using ambient light filtering down from the surface. This photo was taken in an area with a sandy bottom at a time that there was a very strong current (1-2 knots). So the cloudiness you see is the result of the the sand being pulled up by the current. Taking photos of sharks and barracudas is really not dangerous, as the dramatic t.v. programs would like you to believe. They are very cautious timid species that are difficult to approach. Usually you have the opportunity to take a couple of pictures before they frighten and swim away.